Permanent Residents of Canada are issued Permanent Resident cards or PR cards. These cards basically work as a proof of identity for cardholders. Valid PR cards become inevitable especially when you are travelling to and from Canada by road, plane or any other medium. In brief, consider this as your official entry pass – without it you won’t be allowed to enter into Canada. When you acquire a permanent residency certificate, you are issued a PR card. A PR card is valid for 5 years and is essential for free movement within or outside Canada. Residents are liable to renew their PR cards every 5 years before expiry to prove their identity and their residency status. What are the Procedures Involved in Renewal of Canada PR card? It is strongly recommended to renew the PR card before expiry. To do this, you need to apply at the nearest CIC where you would surrender all the necessary documents. Documents must define your history of past 5 years including travelling events, employment status, house address and more, as required. 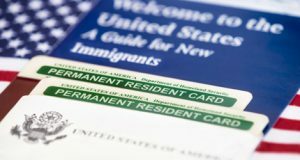 The immigration officer would go through the documents in detail and after determining your eligibility, and your application would be approved. Now, people don’t need to submit their old PR cards as was previously required. The rule was amended for convenience of travelers to travel without hassle during the processing of renewal application.The time you get the new card, the old card would be confiscated from you. You can receive your PR card within 180 days of application submission. How long do I Have to Wait to Get Renewed PR Card? It is advisable to apply for PR card renewal well before expiry as the renewal process takes a few weeks. As per CIC instructions, residents must apply for renewal 2 months prior the expiry date. Our professionals at Nanda & Associate Lawyers can help you in PR card renewal and new application. What should I do if my PR card expires during my abroad trip? What should I do if my PR renewal application is rejected by officers? What to do if my PR card expires during my abroad trip? You immediately need to acquire an official ‘Travel Document’, in case your PR expires during your abroad trip. Consult Canadian offices established abroad and avail them with all the required documents proving your identity as Canadian resident. After reviewing the documents, they would provide you with a travel document to help you enter Canada easily. If you lack necessary documents, try convincing them by telling them your visit purpose and reason for staying away from Canada for so long. The final decision would be theirs whether to issue the PR card or not. What to do if my PR renewal application is rejected by officers? PR renewal application is subjected to rejection on numerous grounds. If the officer is not satisfied with the documents or if you were away from Canada for more than 1095 days and any other reason can make the immigration officer liable to refuse your application. However, after refusal, you are required to immediately appeal at ‘Immigration Appeal Division’ in Canada within the period stated in the refusal letter. You would be allowed to present required documents before Immigration Appeal Division. They would then decide whether the rejection was bona fide or not. You are subjected to lose your PR status if you were away from Canada for more than 3 years. This is the residency obligation and you must qualify it to get the PR card renewed. However, if you couldn’t meet the requirements, you may request same on humanitarian and compassionate grounds. Immigration rules do not favour those who have been away from Canada for several years for any reason. You need to convince the immigration officer to look beyond the residency obligation. Why Hire Nanda & Associates for PR Card Renewal Process? PR card renewal requires handling lengthy documentation and complex procedures. Our professional immigration lawyers have years of experience in assisting people in completing their PR documents and paperwork. Our experts serve appropriate solutions to ensure your Canadian PR application success. Contact us and get assistance from our expert immigration lawyers on PR renewal in India and Canada.